Campaigning tactics during the Delhi University Student Union (DUSU) elections, follow a recurring pattern almost every year. Enormous numbers of pamphlets bombard DU students and infrastructure alike, posters and hoardings litter the campus, party notebooks and pens fly from every direction and walls suffer from having to bear the alphabets of candidates’ names in the most glaring font. All parties put in massive amounts of money to make their presence felt and endorse their candidates. However, while the sheer intensity of party campaigning is ridiculous, social media isn’t still being utilised effectively in the DUSU elections. One need not look far in order to gauge the impact of smart social media campaigning. As the second most followed Indian on twitter, Narendra Modi has been titled the ‘first social media Prime Minister’ of India. In the 2014 elections, BJP carried out an aggressive social media campaign, harnessing the popularity and reach of digital media. Live interaction platforms like ‘Chai pe charcha,’ catchy slogans like “Ab ki Baar Modi Sarkar’, interactive twitter handles, youtube channels and facebook pages captured the attention of the 80 million Indian internet users. Almost 30 to 40 percent of the overall seats had been affected by social media. 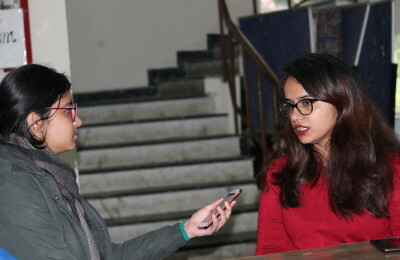 Similarly in Delhi University, capitalising on the social media frenzy and shifting focus to more of digital campaigning can pave the way for a more receptive election. As a two way communication platform, the queries of students can also be addressed by party officials. Extensive digital interaction will make party politics more transparent and keep the voters more informed. Sourcing of manifestos online, hashtag campaigns, live sessions and chat boxes could be more effective than thrusting a handful of pamphlets at random autorickshaws containing students. By sourcing party manifestos online and gauging the response of the voters, their suggestions can be included as well. Digital spaces will not only spark the interest of the voters but will make the elections more participatory in nature. By way of interaction, voters begin to feel like they’re contributing more to the election. Candidates become more than mere names on posters. By now, many students have grown wary of offline campaign tactics. With the NOTA option this year, parties need to gain the respect of the voters even more so than previous years. By situating people dressed in mickey mouse costumes holding party banners outside Vishwavidhyalai station or carpeting campus roads with paper, they’re in no way increasing their respectability. Voters need to be updated during the campaign as well as after the elections by means of a responsible and responsive social media presence on the part of various political parties. Previous PostWorld of 100: Where everything is just 100 bucks Next PostDUSU Election Campaigning: Is it too annoying for college students?